The All-Canada Show attracts many of the finest lodges Canada has to offer - These remote destinations make fascinating features. Morning News Feature - Fillet a Fish with an Axe - the "GREAT" McCreight can do it all; cook a walleye shorelunch, moose calls and fantastic satires of the "bush" are all part of this larger-than-life figure. Norm will provide a live demonstration of a heary Canadian breakfast or an authentic shore lunch. Want to learn to survive the Canadian Bush - Norm will demonstrate a Do-It-Yourself Survival Kit. He is a master guide in both Manitoba and Saskatchewan. Take a Vet Fishing - the All-Canda Show is teaming up with the Take a Vet Fishing program. Vets will get into the All-Canada Show on Sunday FREE ! 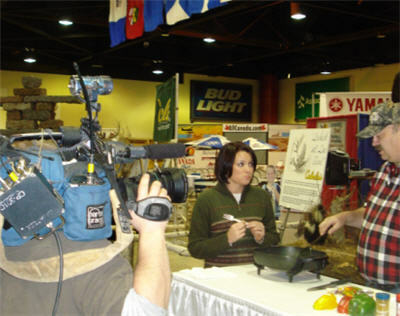 Spence Petros, spokesperson for the program will be the featured seminar speaker on opening night, Thursday, January 9. Invterview a veteran that has participated in the Take a Vet Fishing program and see what this great organization is all about! Among Anthony's accomplishments is being the 2008 Ducks Unlimited International Artist of the Year, 2010 Wild Wings Best in Show, 2009 Louisiana Waterfowl Stamp winner, 2007 Illinois Artist of the Year for Pheasants Forever, and even has a portrait of George H.W. Bush, Sr. hanging in the Presidential Library. Weather-related Angle - A number of very colorful exhibitors live near the Arctic Circle and have great stories about what REAL winter weather is like. Some even come complete in caribou-hide attire! Norm McCreight - this professional hunting and fishing guide hails from Winnipeg Manitoba and is an experienced media professional. This will be McCreight's 28th All-Canada Show Circuit. McCreight's Canadian Accent makes him a media favorite as he shares his wealth of stories about living Canada's wilderness. Local Angle - Here's a great story as to how U.S. residents get into the Canadian lodge business. In each All-Canada Show city, we have a few exhibitors who are native to the area. They have interesting stories and photos to offer. General Interest - We have an endless supply of "unique" stories about life in Canada. Hard News - At each show, there are a number of officials who can talk about outdoor issues, tourism information, traveling in Canada, and current events in our neighbor to the north.